Nestled in the heart of Vineyard Haven, Sonia and Valerio Destefani’s tiny café and bakery, Sweet Bites, bursts with colors warm enough to brighten up even the dreariest of Island winters: vibrant pinks, creamy caramels and every imaginable shade of chocolate. A delicious blend of Brazilian and American flavors, Sweet Bites has perfected everything from apple pie to brigadeiro, a truffle with undeniable Brazilian flair. Sonia developed her pastry skills in her own kitchen in a small town in the state of Espirito Santo, Brazil. She had no formal training aside from the help she got from her three small children and the feedback of her outspoken friends and family. Once the kids were old enough for school, Sonia went back to work and put her culinary creativity on the back burner. 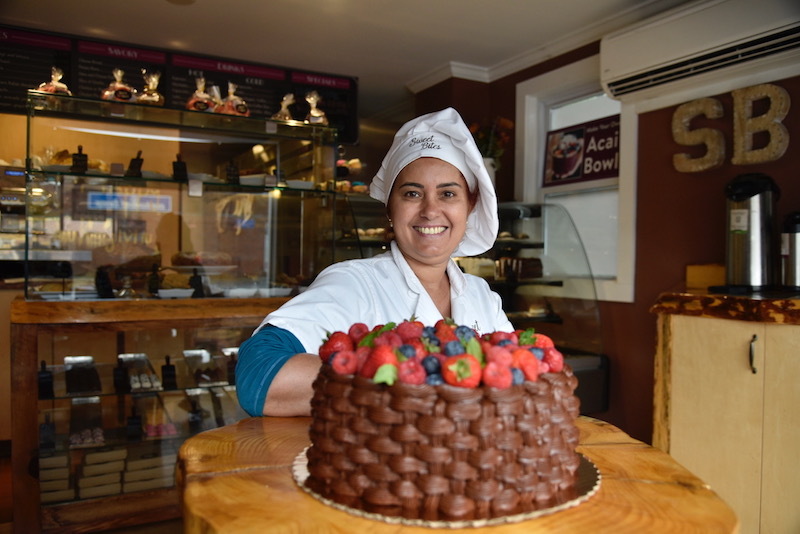 Years later, after relocating to Martha’s Vineyard, Sonia gradually rekindled her love affair with baking, first making desserts for her husband’s restaurant Bite on the Go in her spare time. But before long her sweets got so popular that Sonia heeded the urging of her friends and opened her own bakery. Her business has grown quickly in the past two years. 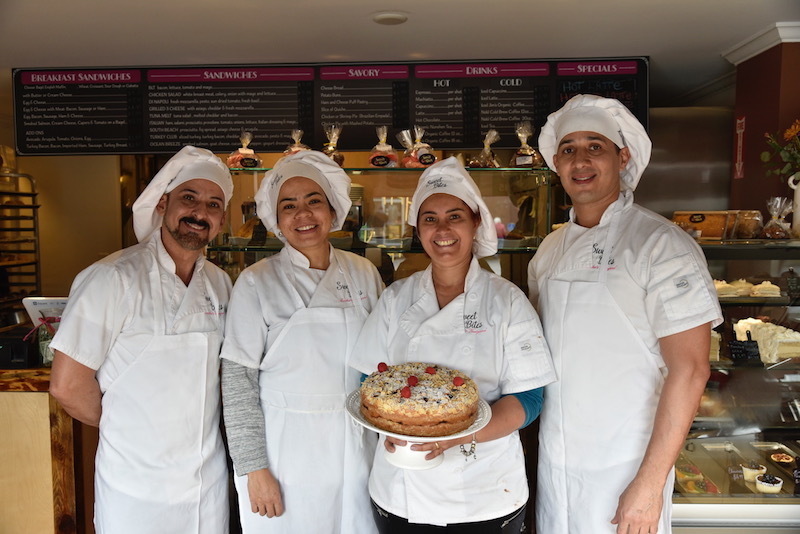 She now employs three year-round bakers—Valeria Evangelista, Marcelo Cavalcante and Magno Costa—who all work together with Sonia to develop and perfect recipes, just like her three children did when they were young. The four of them work hard to keep up with demand all summer long, then spend the quieter winter months mining new ideas from recipes they find online, experimenting with ingredients and techniques until they perfect the final product. Sonia is humble about her process, as if anyone with an Internet connection and a little extra time could achieve what she does. Her dazzling display cases tell a different story. 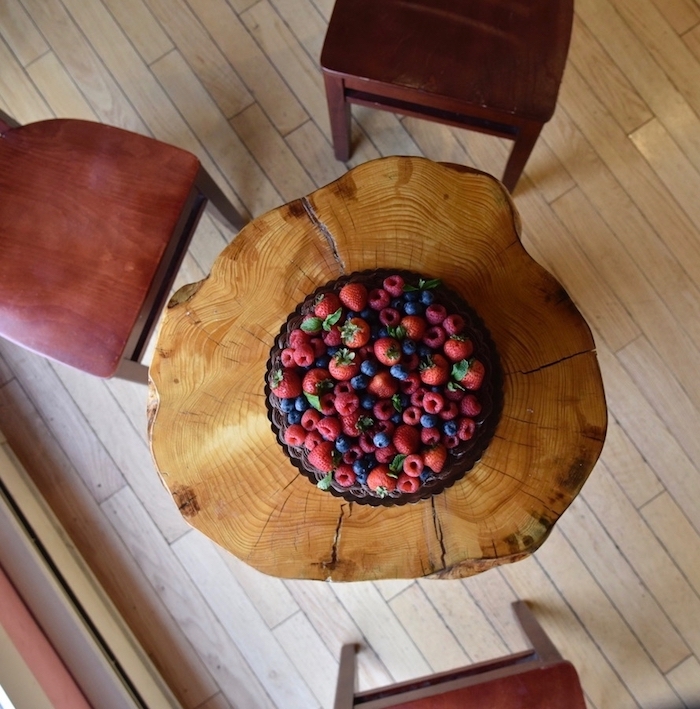 They overflow with the results of not only hard work, but true talent: Golden crusted pies, vibrant fruit tarts and the real secret to the shop’s success — countless varieties of triple layer cakes. Layers of chocolate or vanilla cake are filled with creamy confections ranging from peanut butter mousse to Nutella to coconut cream. Pre-made cakes start under $25, but they are customizable for every occasion and price point. On a recent visit, Sonia invited me into her open kitchen to admire the finishing touches going on a special order chocolate-raspberry-mascarpone cake. This particular cake took over five hours to create, mixing and baking and cooling the chocolate batter, whipping the mascarpone with sugar and cream and then assembling and layering and filling. And then there was a three-hour wait for the layers to set in the fridge before completing the final assembly and decorating. 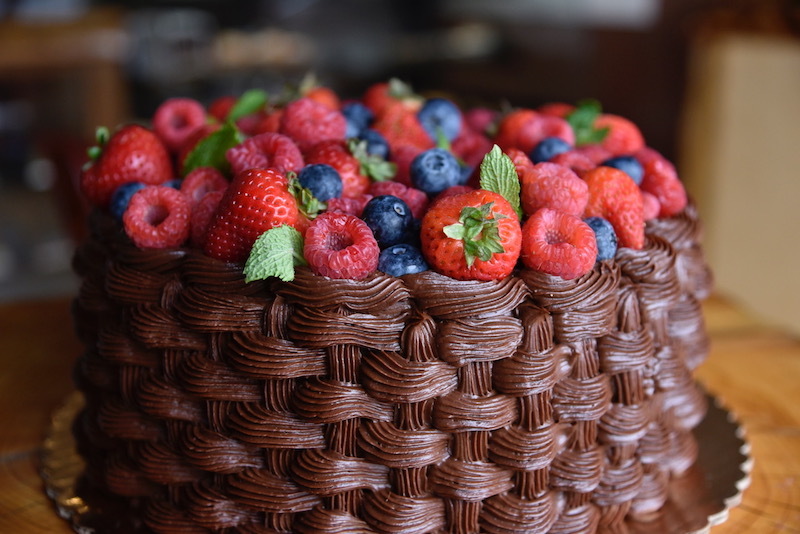 The top of the cake was heaped with crimson and magenta berries and bright green mint sprigs, a sight to behold on its own, without taking into account the elaborate basket weave frosting around the sides. As much as Sonia’s cakes are beautiful to look at, the essence, of course, is the mysterious wonders that lurk within. 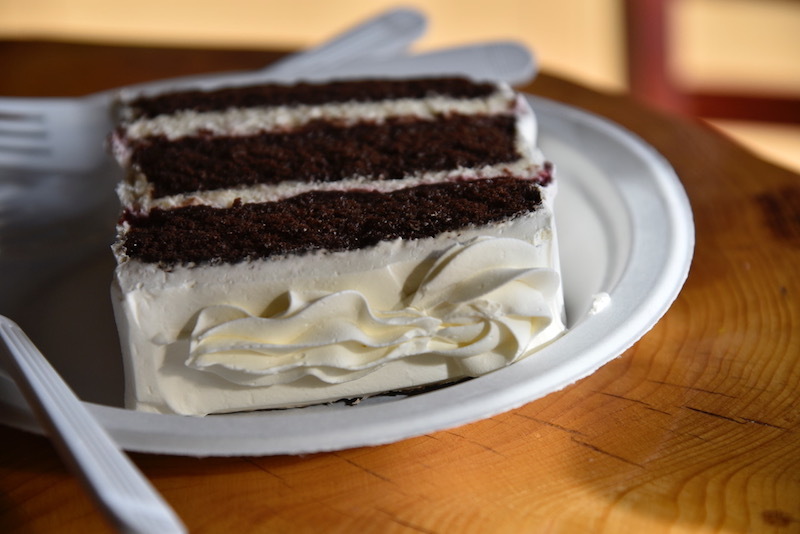 The layers are at once decadent and balanced — rich, tender chocolate cake paired with the creamy lightness of whipped mascarpone and just a bit of tart raspberry in between. Extravagant chocolate ganache balanced by simple fresh berries. It is Sonia embodied — impressive, welcoming and uncommonly sweet. Kate Tvelia Athearn is a writer and educator based in West Tisbury where she lives on a small farm with her husband and two teenage sons.